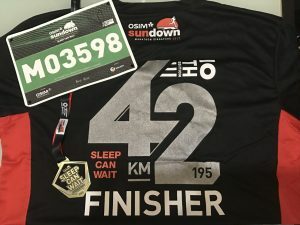 My First Marathon | JustRunLah! There is always first attempt in life and without this first, you will never get to experience but just imagine it. So.. Just Go For It !! When I start picking up running in mid 2015, it is because being drawn by the “Most Scenic Run” of the ad of ST Run 2015 and also for health reason. 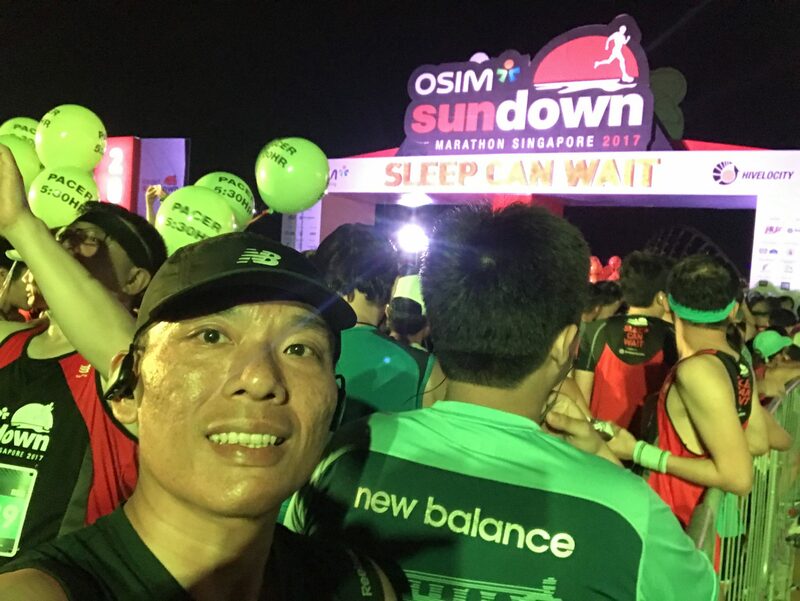 A marathon is something that I had never think that I will do, but I actually did it in last week’s Sundown. I must be crazy and too ambitious when I signed up for it last year when they start the registration. With only 1 HM experience with Sundown 2016, I told myself that I still have few months to train. But that was the only HM I had done before this race. The other races I had completed are the 5 TPS races which help me to improve my timing over the races and eventually I achieved my sub-1 timing in Race 5. And the 3 months of 21 Days Challenge also help me to commit more time for running. 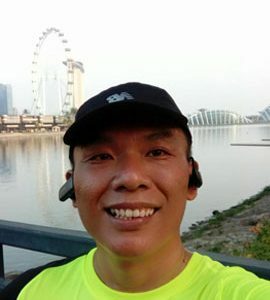 Although it is 21 Days Challenge, I can only afford 9-12 days each month, which means I had to do about 8-14km each run. I even had to run on my work trips in KL and Christchurch to make sure I can meet my 100K target. And this somehow prepare me for this race I believed. This Sundown invited lots of criticism from pre-race to post-race. It is pretty stressful with the updates from fellow runners sharing the chaos they faced during the race pack collection. I only hope that I could manage to get my bib so that I can join the race. But I am fortunate to collect my pack within 20 mins on Friday. Heng Ah..
After some delays, the race started. We seems to be in wave 2 or 3, I am not sure, but excited to go. Passing through the crowd along the F1 pit, we ran up along Nicoll Highway and to Sportshub. Everything is good, but I am not discipline enough to keep my pace and pass by the 5hr pacers. After the stretch of Garden by the Bay East, I started to slow down and go for the drinks. And that was when I started to walk-run-walk. I think the walking parties did have negative effects on me. I lost that determination to keep up the 7min pace. Along the East Coast stretch, the 5hr pacers came by. I tried to follow them but my legs had failed me (actually is my mind). I continue to walk-run-walk and the aim was not to let the 5:30hr pacer catch up. And I later develop a strategy that is to walk for 0.5k after the hydration point and run till the next hydration point. With that, I continue till we are back on ECP before getting my that long endless slope which I actually walk up. Once at the downslope, I start running and there is the 38K mark, 4.195K to go, and the time is still within 5 hr. But my knee started to hurt, I just have to continue my walk-jog-walk. And just before the 41K mark, a student was there cheering and motivate runners. “Mind over Body” she said, easier to say than done I thought.. haha.. but somehow I started to pick myself up and start running. “Mind Over Body.. Mind Over Body” I kept saying it in my mind till I got myself passed the finish line with 5hr 31mins. I did it !!! haha.. The strange thing is that I never get to see the 5:30 pacers.. The run itself is not just a run, I also enjoy looking around. Some volunteers are very cheerful, motivating, some look bored. Some runners will take selfie at every KM markers and some seems plan to walk for the whole 42Km. I also stopped by to check out a guy that was vomiting and a lady that dropped her phone. And there are few elder runners that are very fit and going on a constant pace, that inspired me and I hope to continue running and stay health for as long as I could. Health is Wealth. For those who still thinking of attempting a FM, go for it. 5x10K is not equivalent to HM, and even 3 HM is not equivalent to a FM. I will definitely be back next year, and hope to do a sub-5 target. Meanwhile, I have 3 TPS HM to prepare myself for the next FM. Good job on your first FM! Well done!